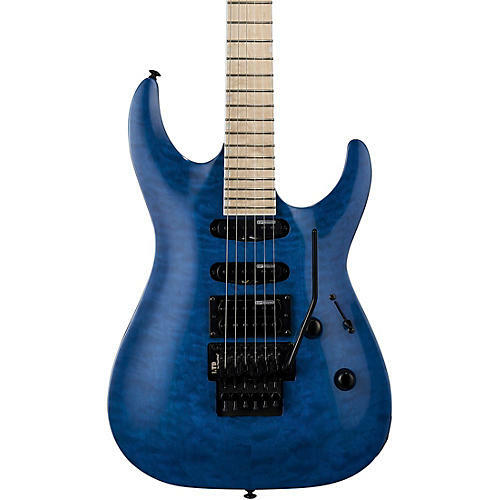 The MH-203QM offers the arched top of the ESP Horizon with the aggressive styling elements of the M Series, all wrapped in an affordable high-quality instrument with a quilted maple top in See Thru Blue finish. With a versatile H/S/S (humbucker/single coil/single coil) pickup configuration, it's fits beautifully across many different styles of music. The MH-203QM features bolt-on construction of a mahogany body with a maple neck and maple fingerboard with 24 extra-jumbo frets, and includes an LTD by Floyd Rose tremolo.